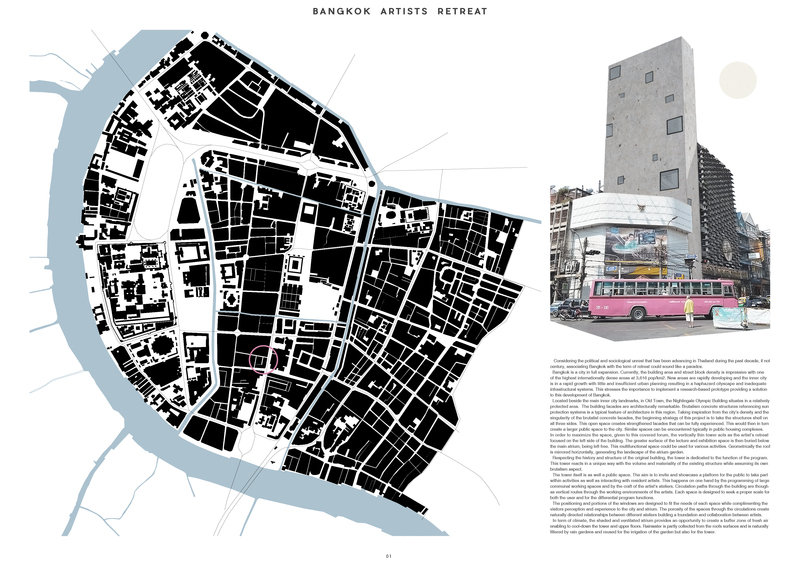 The Bangkok Artist’s Retreat competition is a case study in how to engage the public with the arts. 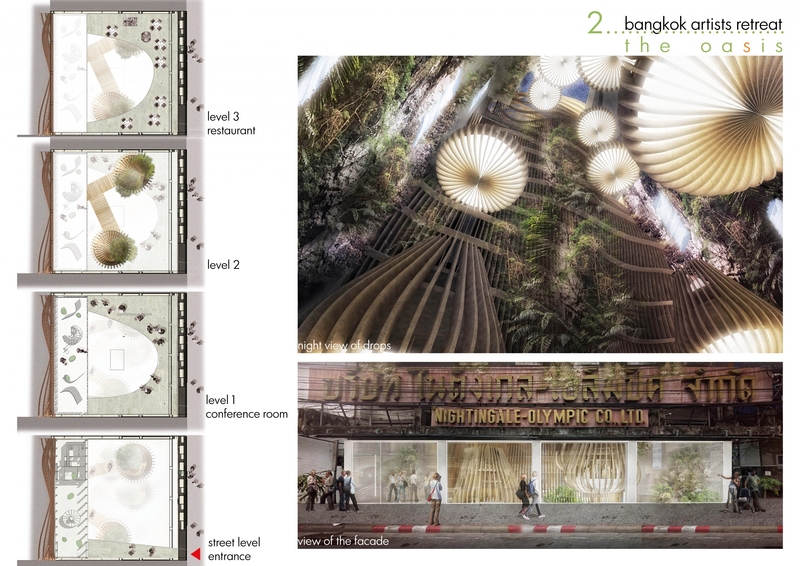 By repurposing a brutalist department store, the projects are requested to reflect on both the history and the future of this Bangkok site. 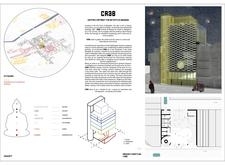 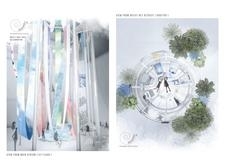 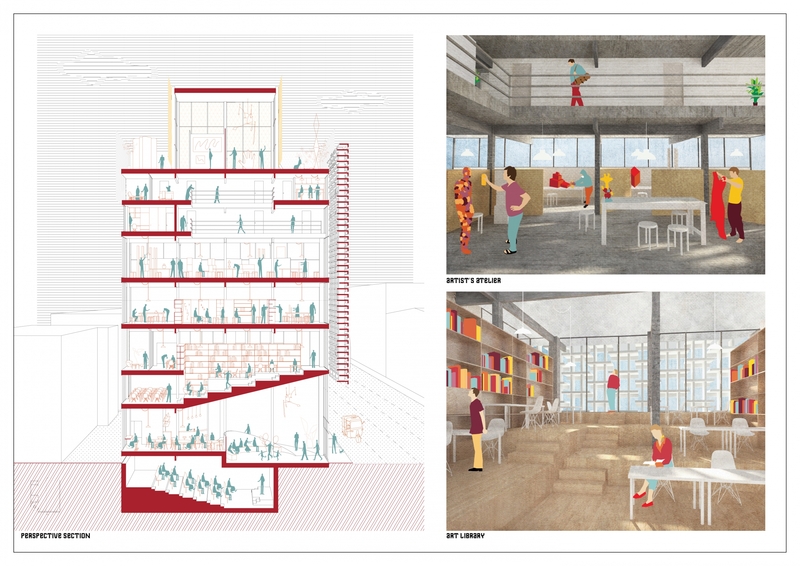 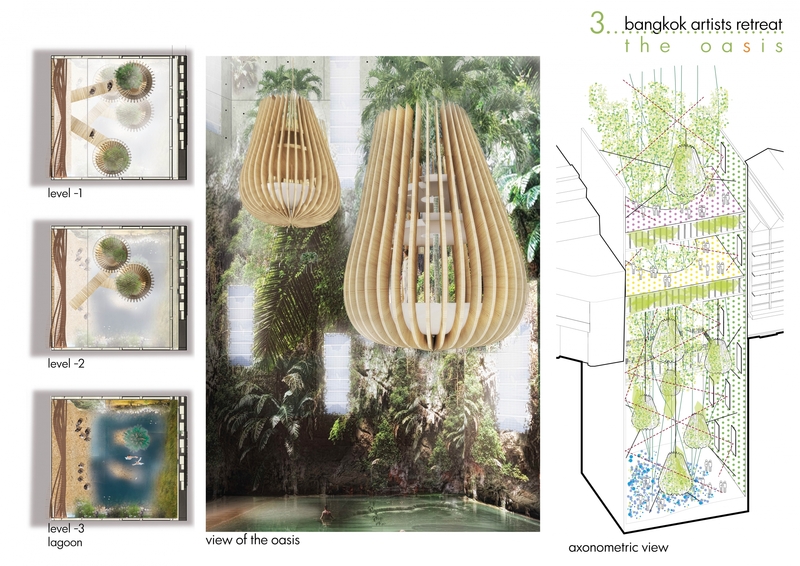 The loosely-defined program may be interpreted in many ways, and the judges placed particular focus on projects that displayed a strong concept that was clearly represented and logically expressed in the architecture. 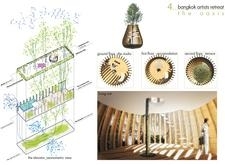 Each entry was evaluated on a number of criteria, including but not limited to: strength and clarity of concept, originality, quality of presentation, appropriateness of scale, appropriateness to context, and most importantly, its strength as an artist community in Bangkok that welcomes the public to learn and grow in their shared creativity. 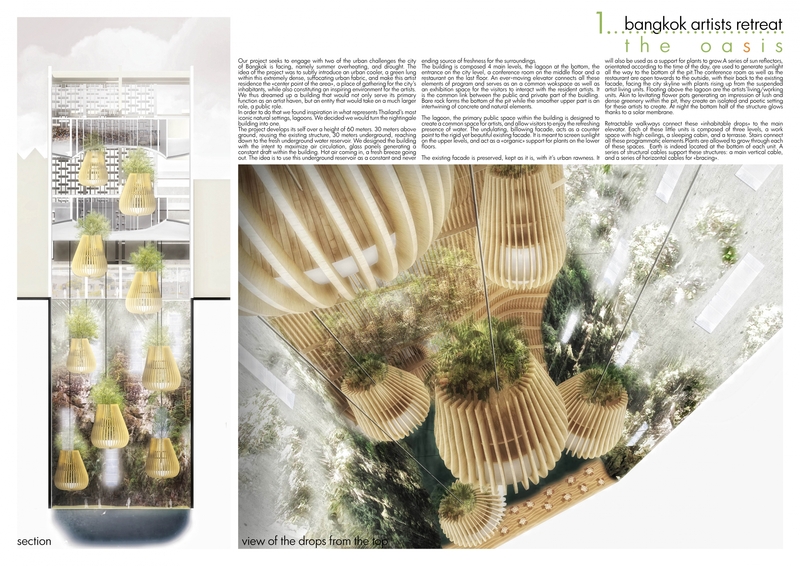 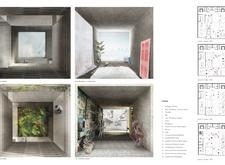 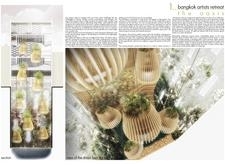 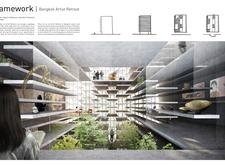 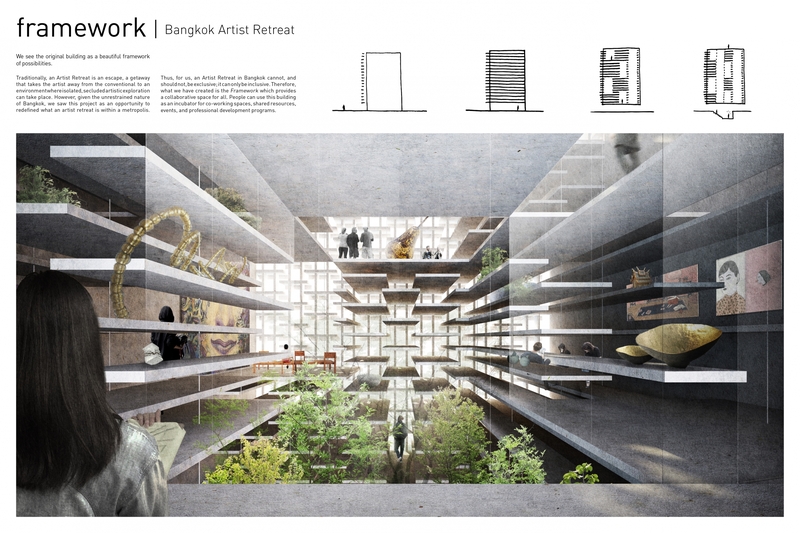 Bangkok Artists Retreat winners featured in Archiworld - South Korea largest printed architecture news magazine! 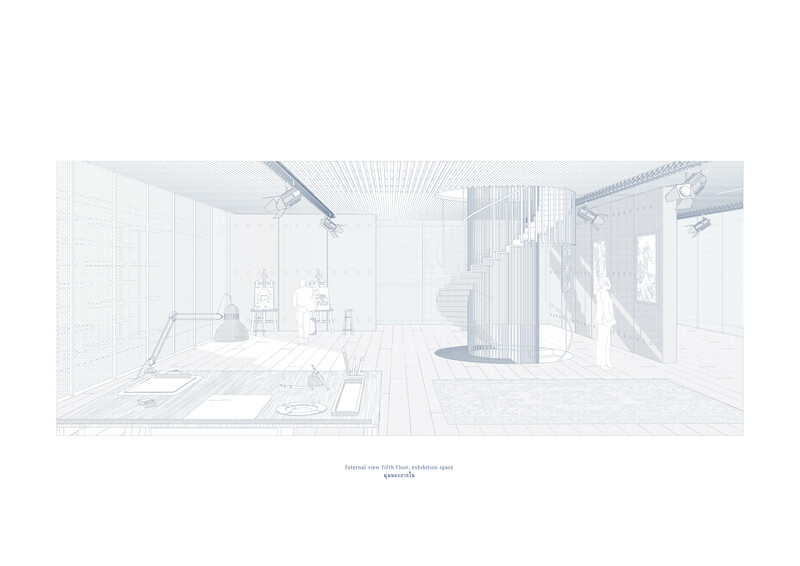 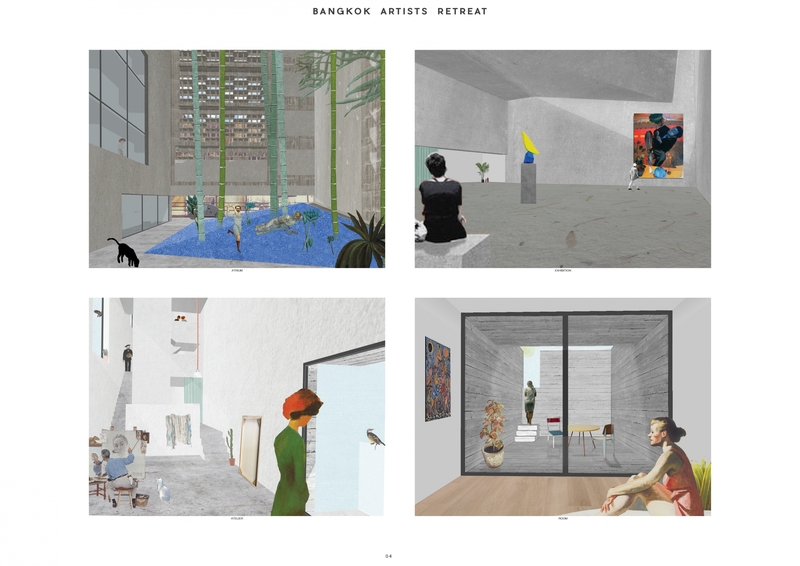 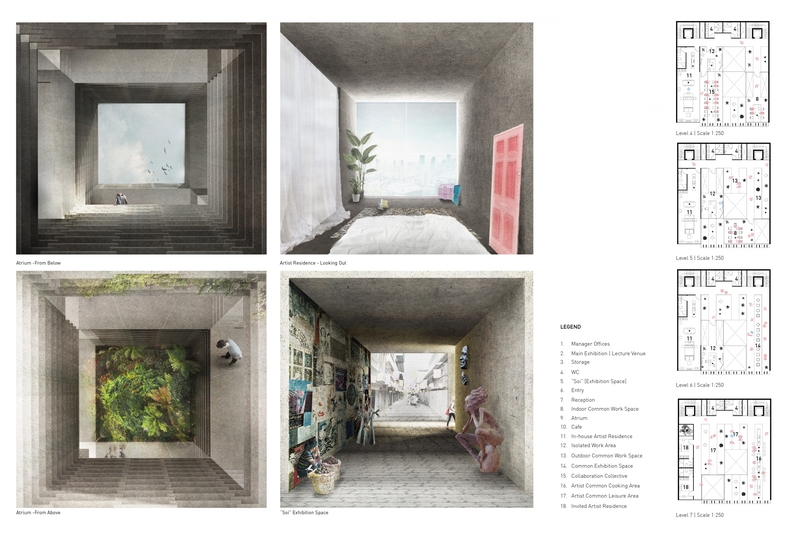 Bangkok Artists Retreat competition winners revealed! 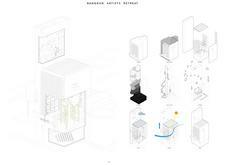 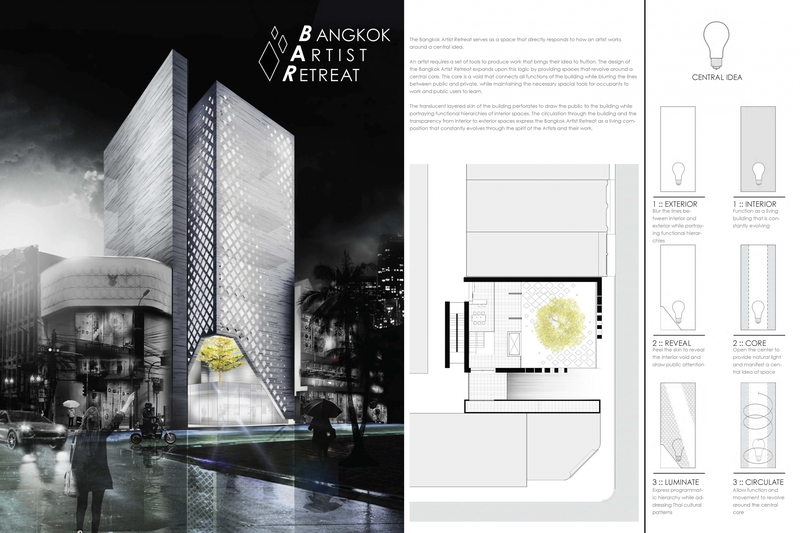 Bangkok Artists Retreat architecture competition is launched! 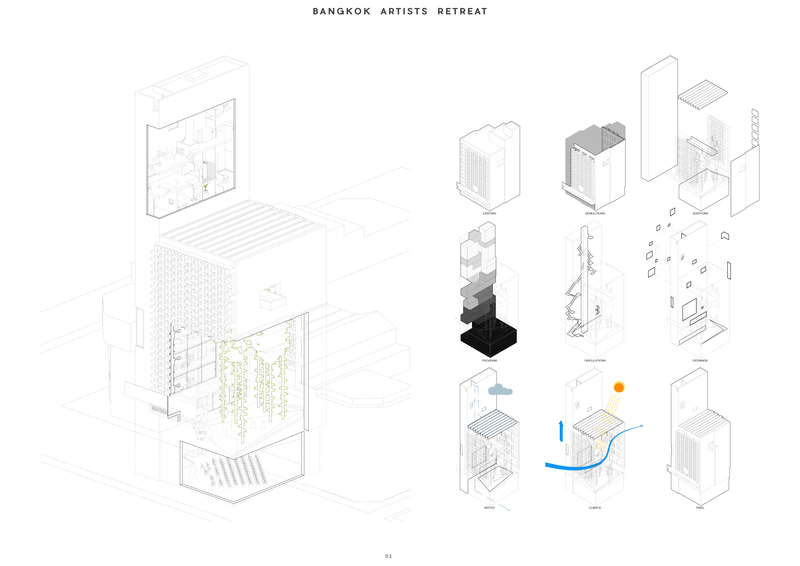 The Bangkok Retreat Artist project is clean, concise, and clearly illustrates its simple central idea. 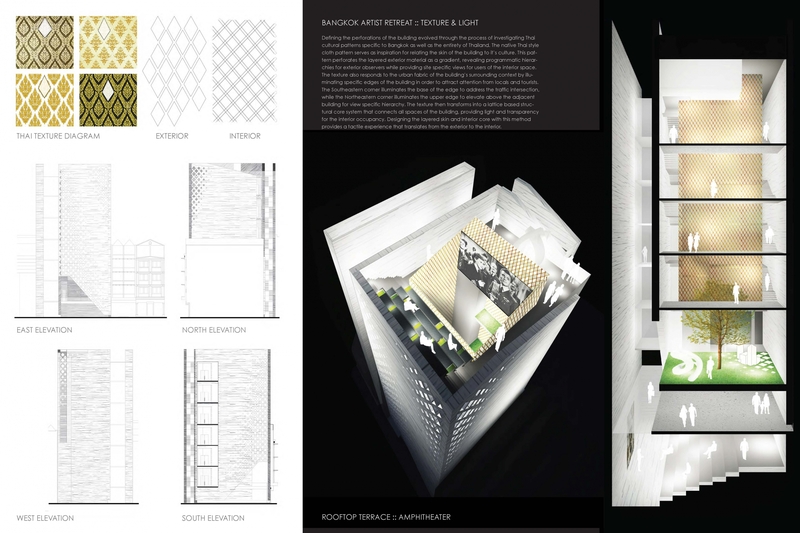 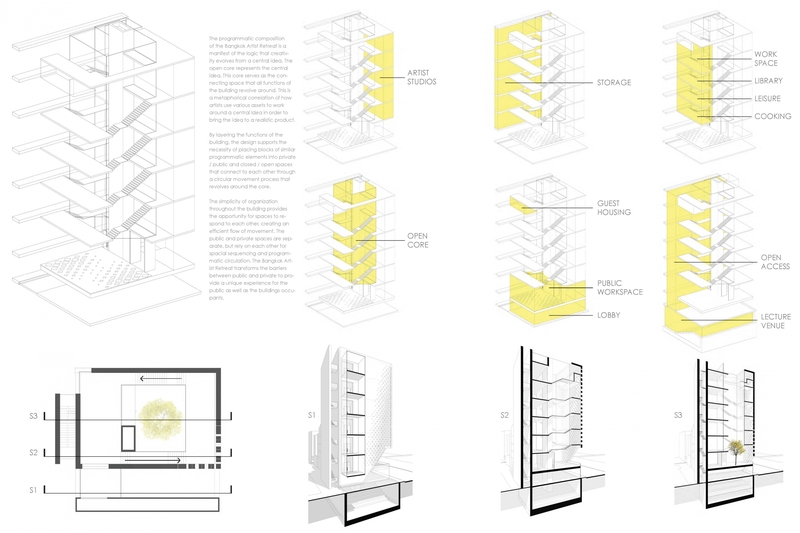 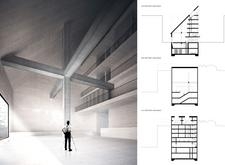 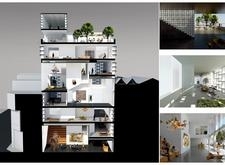 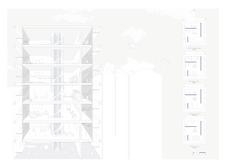 Throughout the building, public and private spaces are staggered and stacked as a series of modules that result in the final spatial composition. 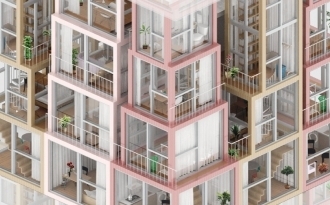 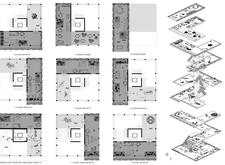 Inside each of these building blocks is both a public and private component, and these are distinguished by the variant spatial experiences of the two. 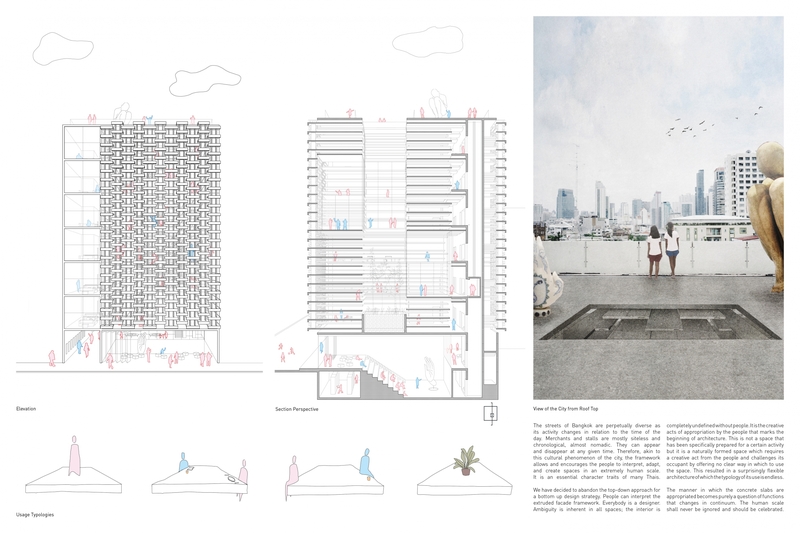 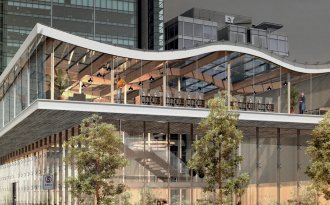 The public, visitor-oriented spaces are double-height with a transparent façade and full of natural light while private living and studio spaces are single-height with a brise-soleil façade and filtered light. 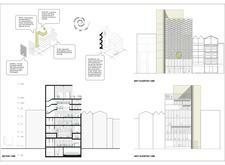 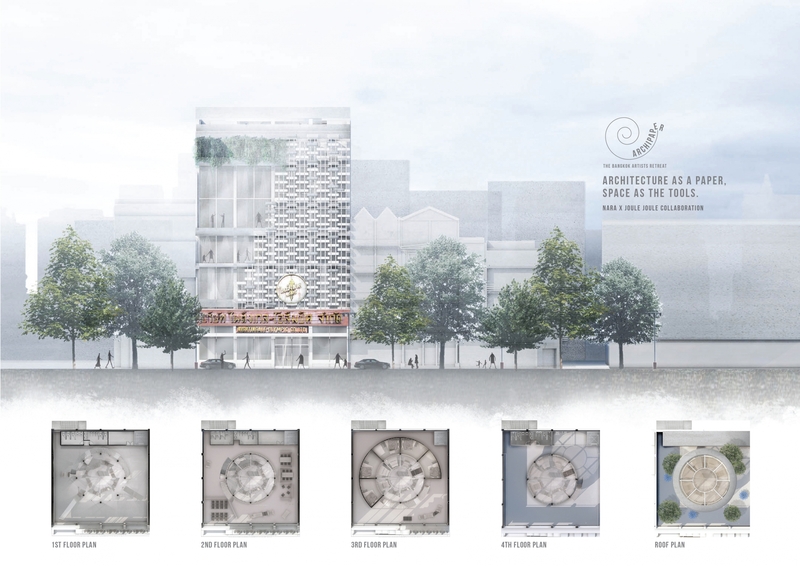 While the competition brief made no suggestion of whether to use the existing brutalist façade or not, the judges felt this project incorporated a nice balance of old and new that reinvigorates the brutalist façade without introducing distracting new elements and geometry. 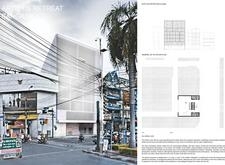 This results in the brutalist façade being reborn and repurposed – given new life while maintaining the central historical focus of the building’s elevation. 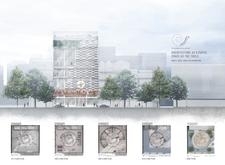 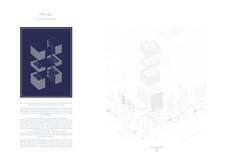 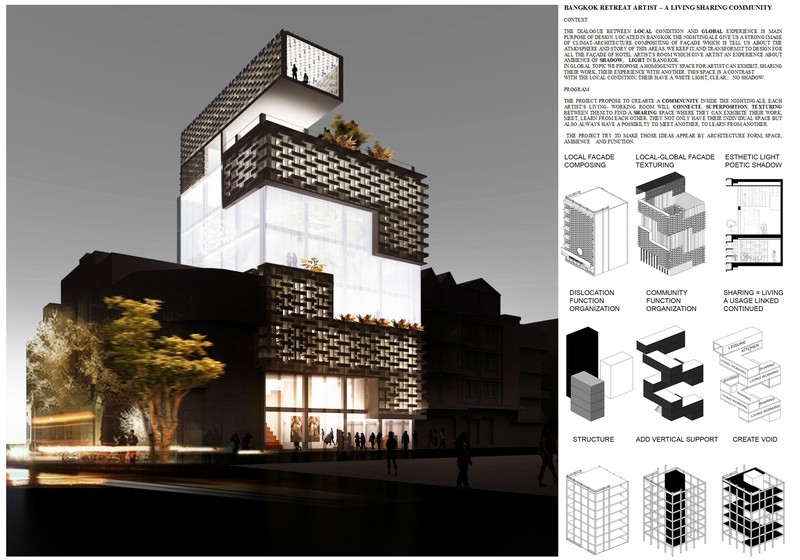 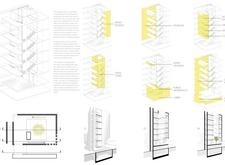 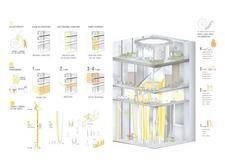 The diagram and concept are very clearly illustrated via a series of stacked L-shape building blocks that incorporate the private and public functions while rotating around a central vertical axis. 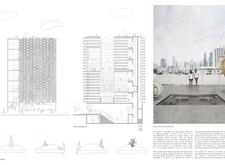 The simple spatial L-shaped block arrangement is then resolved at the top with a restaurant roof terrace and public café, affording the public sweeping views across the city. 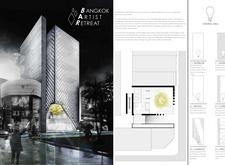 All in all, it is a project that is clean, clearly represented, and carries the potential to celebrate the future growth of arts and culture in the Bangkok region while still referencing its rich history. The Archipaper project introduces a compelling study on the process of making art, rather than focusing purely on the result. 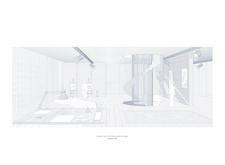 As one circulates through the project, long rolls of paper feature artist sketches and in-progress works. 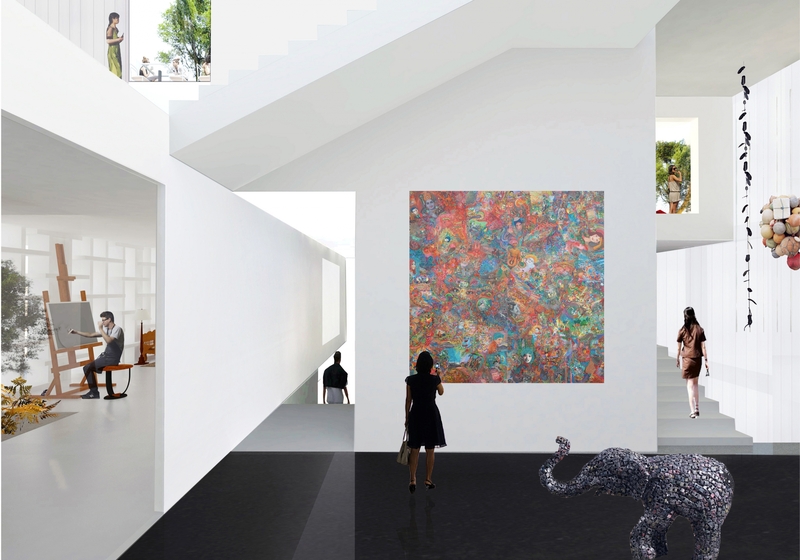 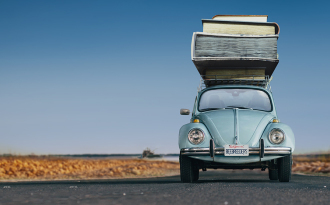 While experiencing this artists retreat, the public is not only able to view final exhibitions of art, but also the process itself, which adds a deeper layer of meaning to the project. 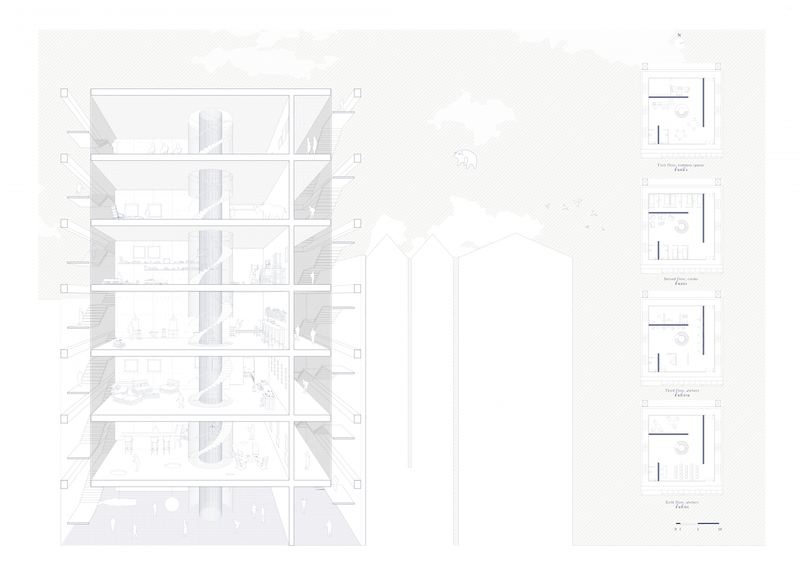 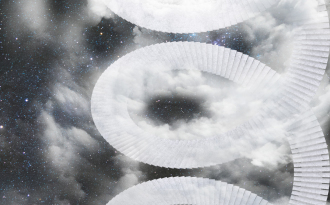 The radial arrangement of space in plan is a logical step from this core concept, and is loosely reminiscent of the roll of paper unrolling to produce its blank canvas for the artist. 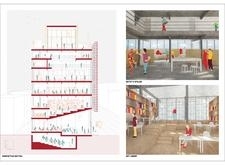 The organization of the building also honors the public space function of the program as it places the more public functions closer to ground level and its street life, while the private functions remain above, isolated from the street activity at the top of a large helical staircase around the central void. 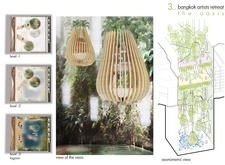 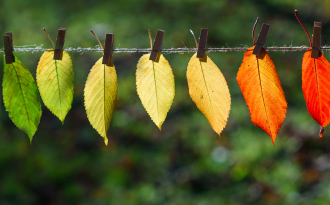 The details of the presentation are well-executed and attentively carried through, and it was one of the few to address the possibility of creating and exhibiting different types of artwork using various media rather than simply painting or drawing. 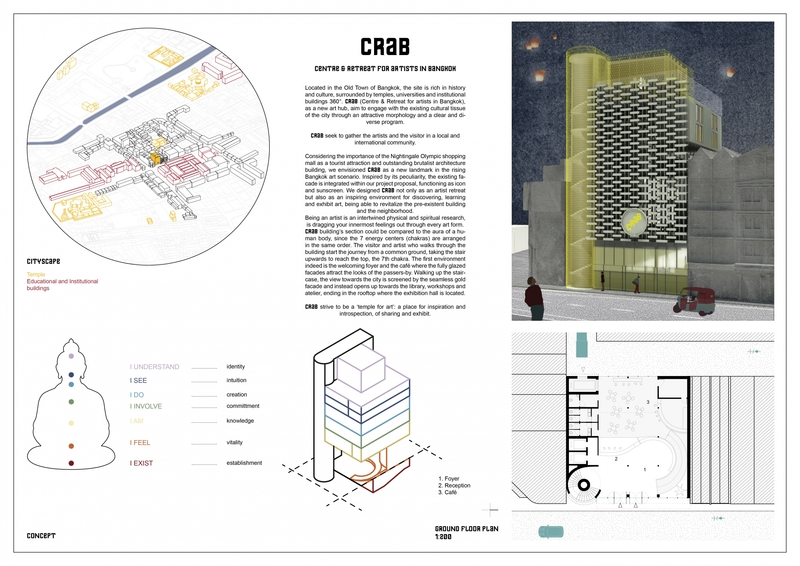 Unlike other projects that divided the artist space from the visitor space, this building allows the artistic works-in-progress to invade the public space below, thus encouraging another level of engagement with the public. 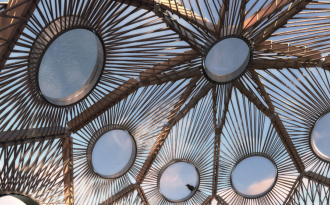 This takes a step beyond the more formal museum or gallery setting, and instead encourages the visitor to reflect on the final art pieces as well as their sketches, prototypes, and failed previous studies. 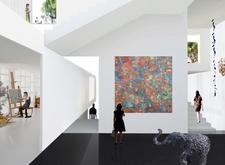 In a sense, the visitor is treated to the rare opportunity of entering an artist’s studio without compromising the privacy and process of creating the art works. 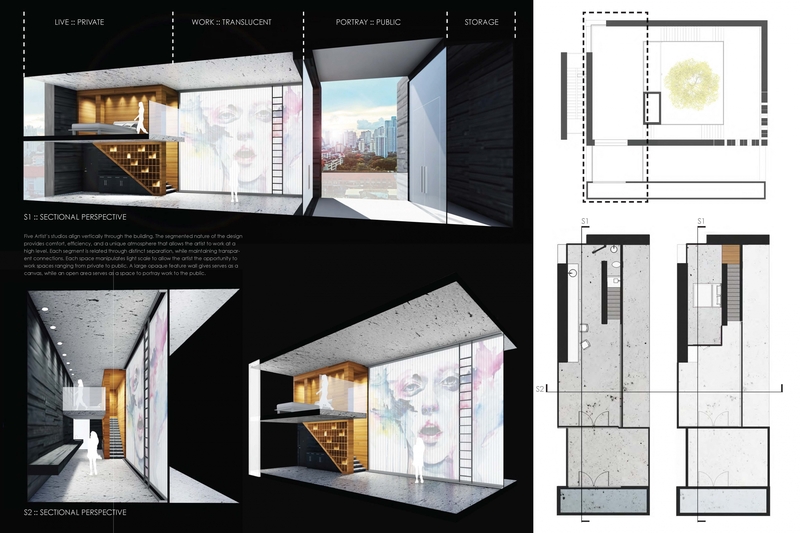 Part of the magic of a studio is the mess of earlier attempts that reveal the true nature of an art piece. 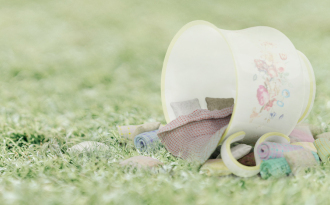 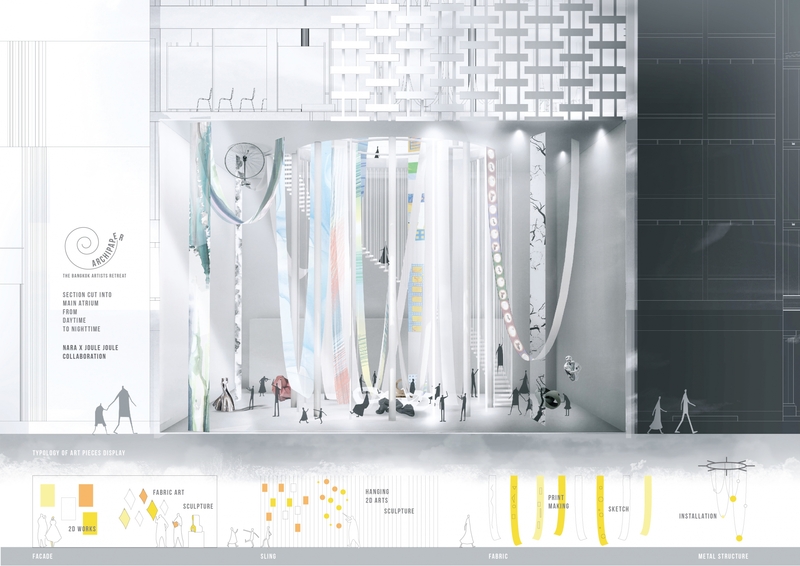 This project’s success lies in the potential to present a carefully curated mess to its visitors, ultimately with the hope of sparking curiosity and creativity for all. 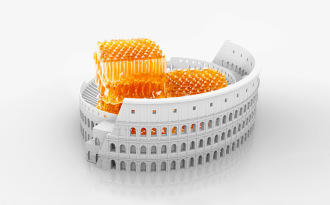 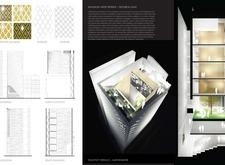 Framework is a project that presents a highly abstract yet democratic approach to its architecture. 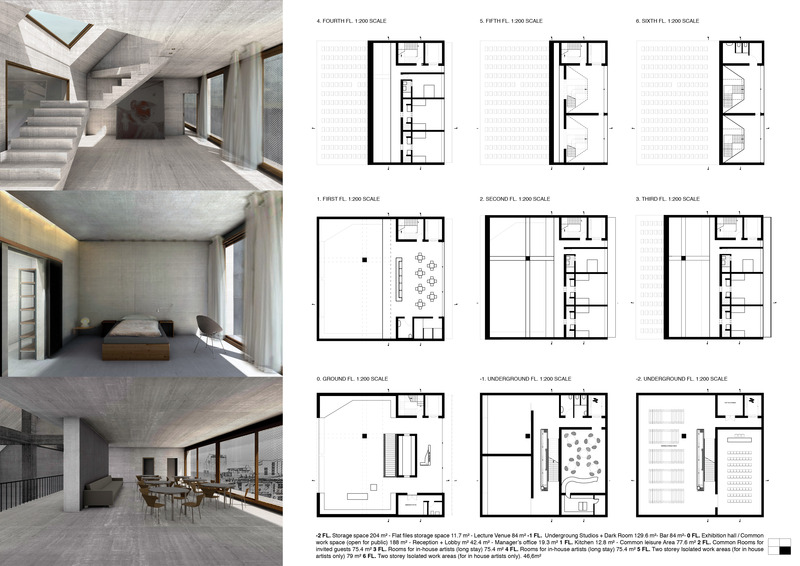 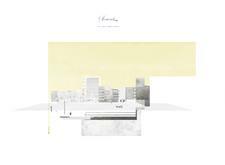 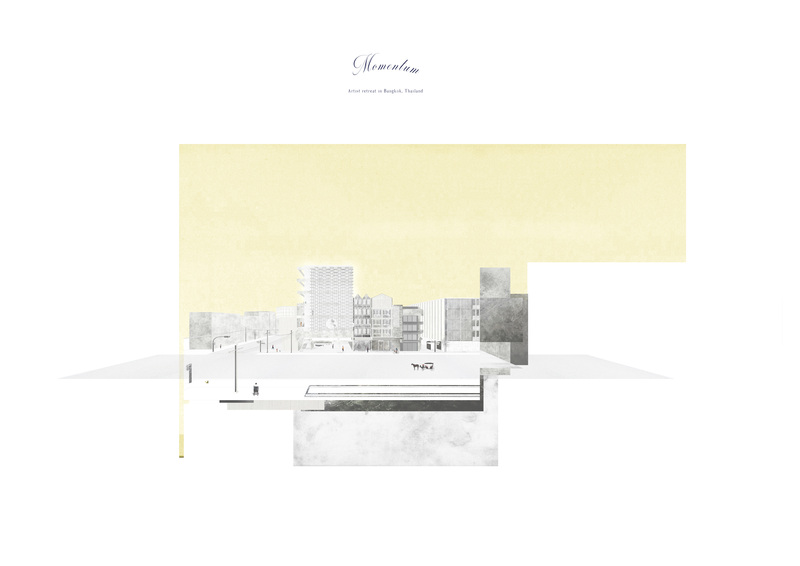 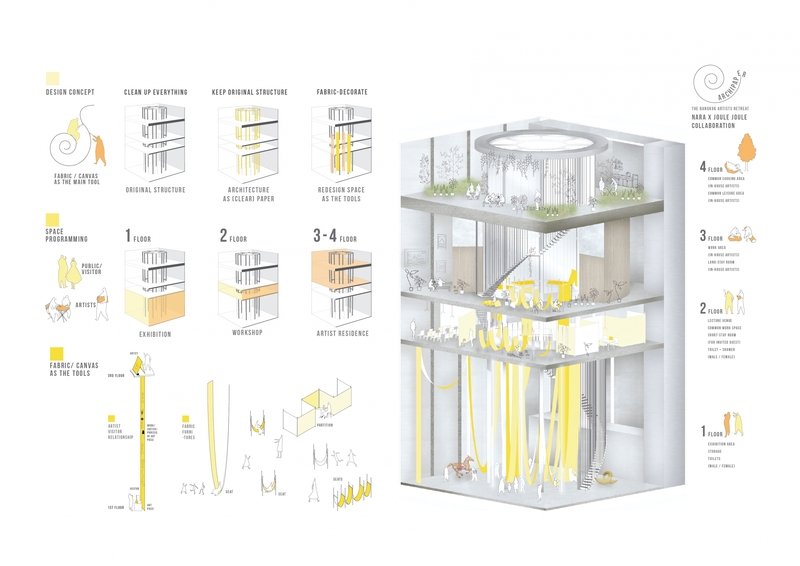 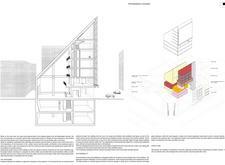 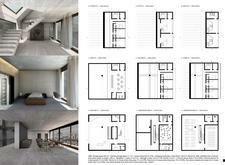 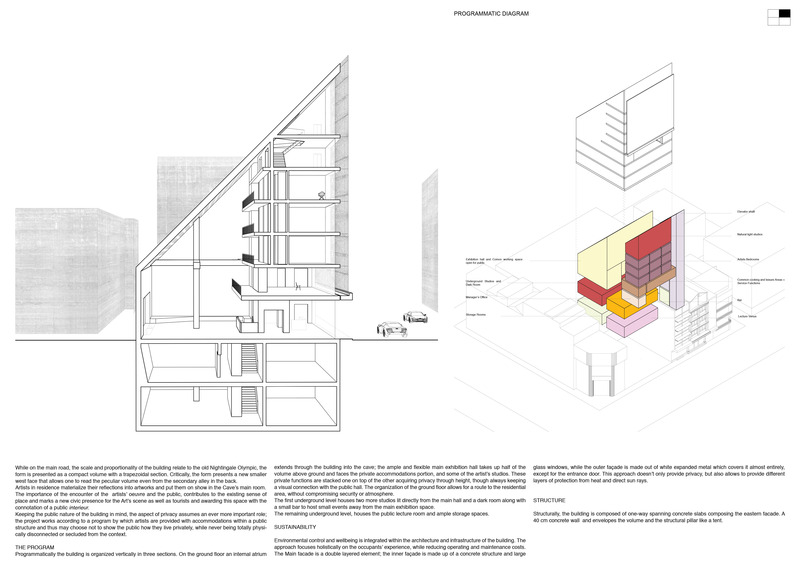 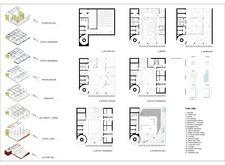 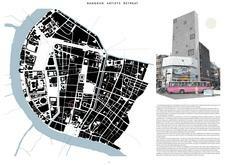 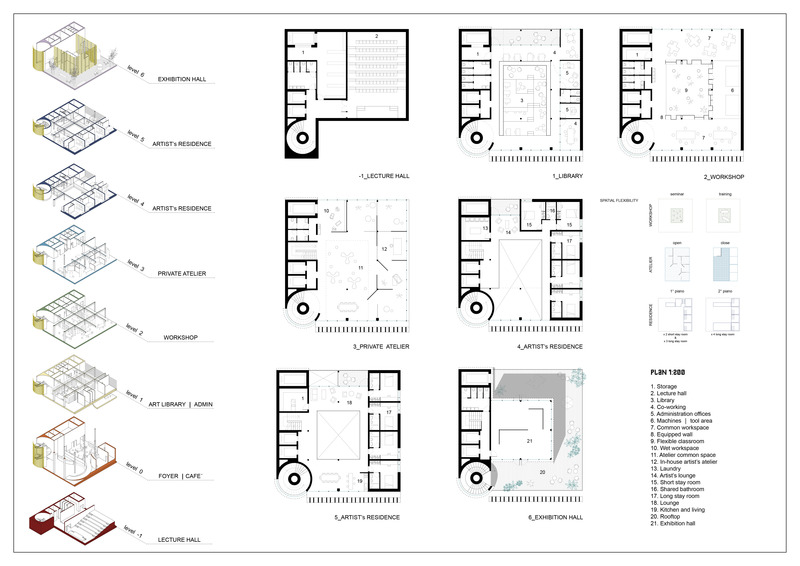 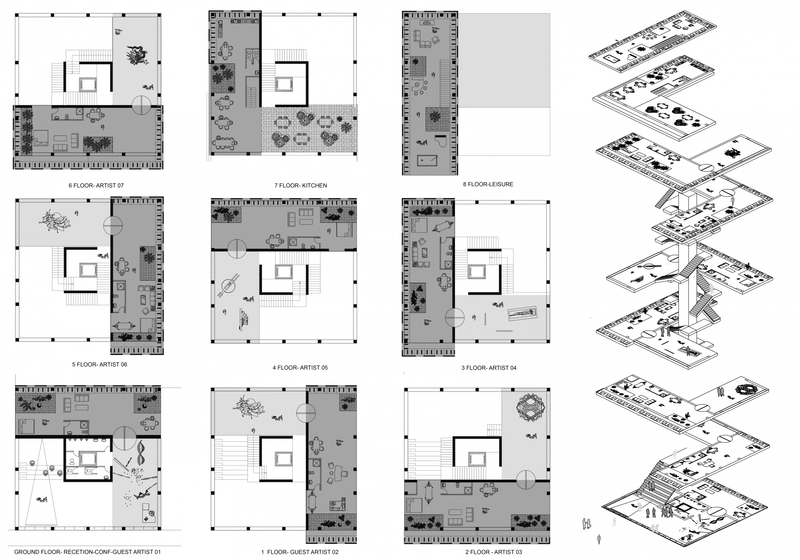 Instead of providing a series of programmed spaces, this scheme suggests that it is the inhabitation of the place that makes the architecture, rather than the architectural program predefining the inhabitation space. 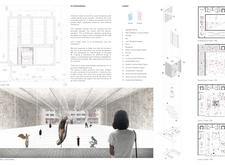 This proposal also presents a clear and concise approach to attracting the public inside by dividing its ground level between a large public pathway and an auditorium for public events. 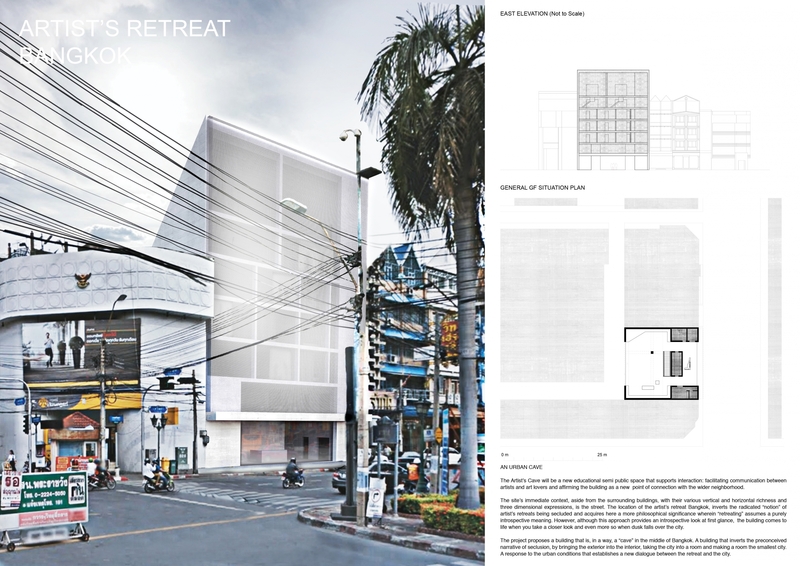 The walkway extends through the structure and buildings behind, which successfully reinforces the artist retreat’s activity by connecting it through the city block. 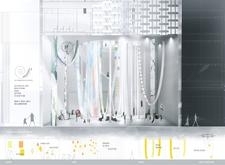 The scheme honors the competition’s call for a center that engages the public by creating a ground-level hub of activity that encourages visitors and curiosity. 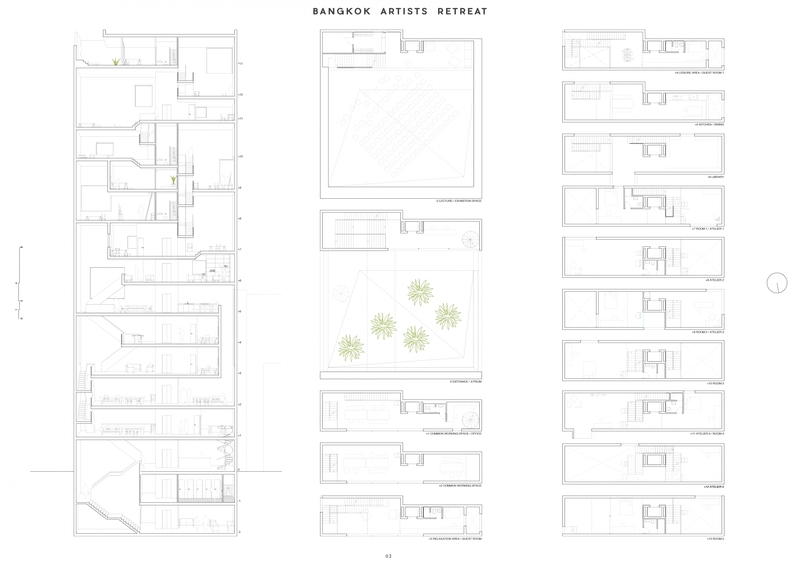 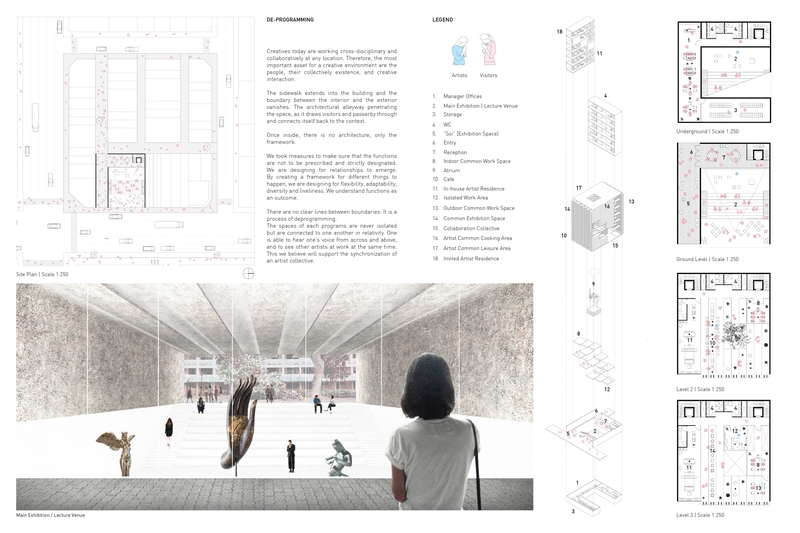 Unlike many other submissions, this project does not define specific spaces for artists versus visitors, and instead allows all people and functions to mix in order to provide the maximum exchange of ideas and experiences. 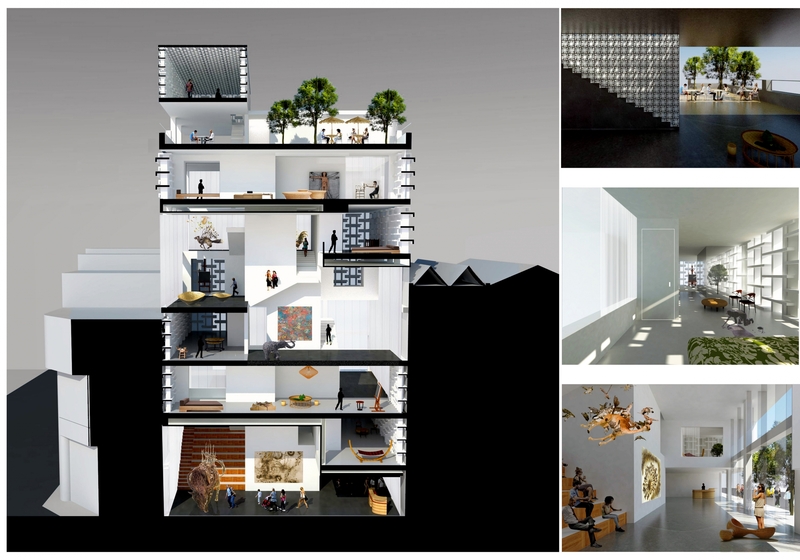 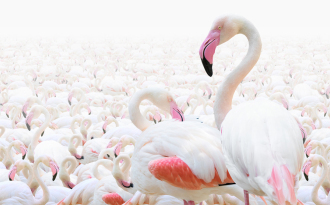 In this sense, it is reminiscent of artists squatting in a building open to the public, which has precedents around the world and can attract energy due to the clandestine nature of the artist’s activity. 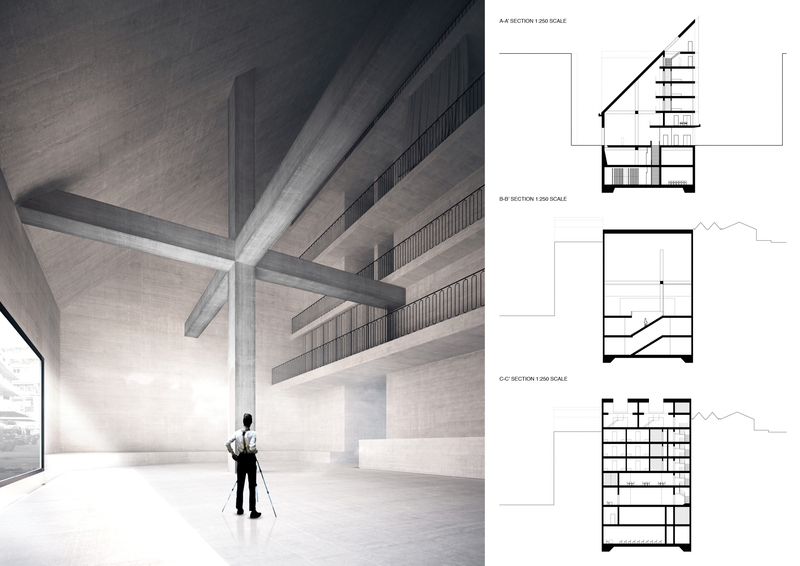 The building itself, in a sense, becomes the artist’s sketchbook. 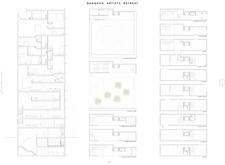 It is dense with layers that begin as a blank document but are slowly filled with art over time. 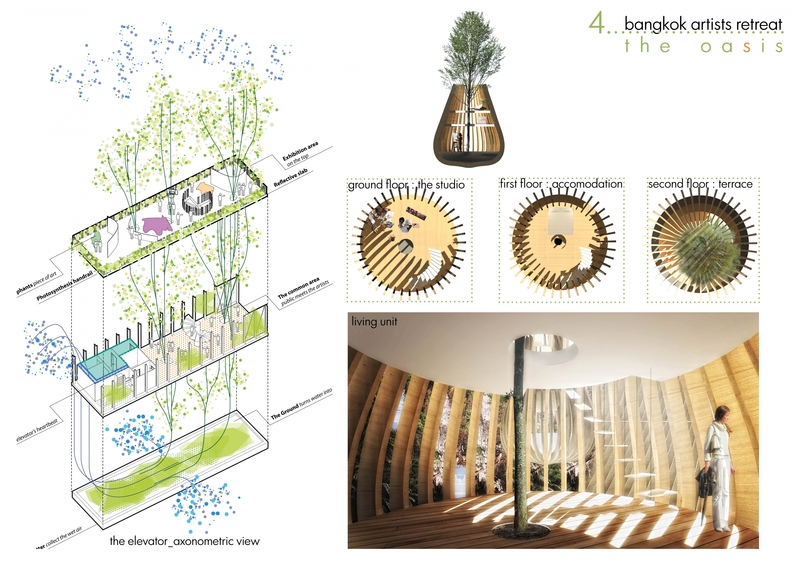 It is a visual playground for visitors to explore these ideas, and perhaps even be inspired to contribute their own.